Content by Tony Macklin. Originally published on December 26, 2011 @ tonymacklin.net. The "Rainbow Connection" is reconnected in 2011. It's a dazzling reunion. The Muppets is a joyful mix of the nostalgic past and a vibrant present. It tops the list of family movies for the holidays. If you're a Belgian child who likes Spielberg's ego, The Adventures of Tintin may be the holiday movie for you. But Tintin is no Muppet. 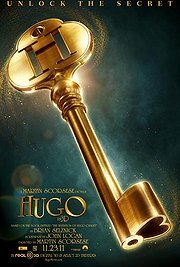 And there may too many tick tocks in Scorsese's Hugo to keep the kids awake. But The Muppets should appeal to all. It's lively, colorful, and clever. It has engaging wit. Also, every time it starts to slow down, there's a welcome explosion to keep the attention keen. There are several songs. When I was a boy seeing the latest Abbott and Costello film, whenever it was interrupted by song and dance, I wanted the music off the screen, and Bud and Lou back. The Muppets also has an ideal song -- a potential Oscar (not the Grouch) winner. The song "Man or Muppet" has a terrific rendition. One of the singers is a perfect choice and a delightful surprise. And, of course, "Rainbow Connection" may stir up some fond memories. 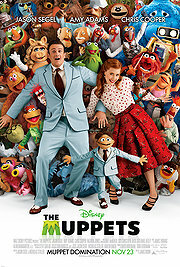 The Muppets is the tale of two brothers -- puppet Walter and human Gary (Jason Segel). For the tenth anniversary of his dating his girlfriend Mary (Amy Adams), Gary plans to take her to Los Angeles. Of course, Gary has to bring Walter along. Gary and Mary are innocuous white bread. Walter is the ham in their sandwich. In LA, the odd trio visits the decrepit, vacant Muppet Studios, and avid fan Walter finds out that that it going to be torn down by villainous oilman Tex Richman (Chris Cooper). Richman is a hiss-worthy villain. His mantra is, "maniacal laugh." And Cooper does a spirited, incongruous rap praising greed. If the Muppets don't raise $10 million immediately, a contract states the Studio will fall to the villain, who has evil plans to destroy it. The Muppets have to be brought together again for a benefit to save their studio. It seems like an impossible task. They are spread across the country in various states of decline and deterioration, and Miss Piggy is in Paris. But never underestimate the power of the past and the peculiarities of the present. Walter struggles to save the Muppets he loves. Jason Segel wrote and produced The Muppets, and it was directed by James Bobin. Segel's dedication to the Muppets and their minions has a warm heart and active mind. 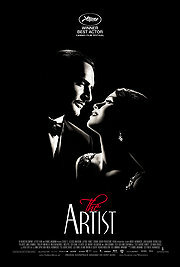 The movie asks the question, "Do you have what it takes to be one of the Muppets?"